The Plzeň brewery museum in one of the old Gothic houses at the edge of the old town is the place to go to immerse yourself in the history of brewing, brewing techniques and anything connected with the history of beer in Plzeň. 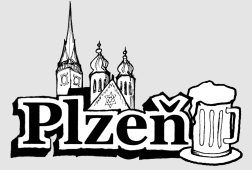 Be careful not to confuse it with the tour of the actual brewery across the river behind the old gate and water tower that appear on Pilsner labels across the world. Entrance to the museum is from a small courtyard just off the corner of and Veleslavinova streets in the north-western corner of Plzeň's old town. The brewery museum is open seven days a week, year round from 10am until at least 5pm. After purchasing your ticket and choosing between an audio guide (30Kč extra) or printed text, a short staircase leads down into the first room of the brewery museum. 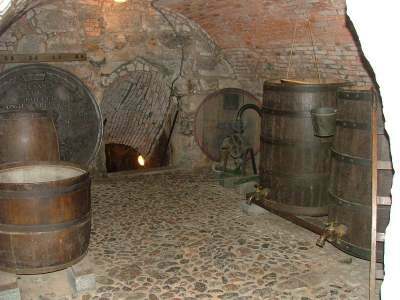 The museum begins at the beginning of beer, covering the history of brewing in Mesopotamia, Egypt, Ancient Greece and Rome before descending another staircase into the old malting room to concentrate on the history of Czech brewing. Text panels and diagrams explain the development of the craft and the rest of the malt room displays a collection of historic brewing equipment. I thought the most interesting things were the various antique bottle presses, but there were also carts, filters, a fire proof safe, a stone-walled vat for steeping malt and a curious gadget that wasn't labelled but looked something like a miniature beer-powered jet dragster. After a quick peak outside at the old city walls, the direction of the tour leads upstairs to the room where the hops were dried and explains that process with the aid of a short video. There's also a mocked up cooper's (barrelmaker's) workshop and functioning scale model of a brewery that took a Mr. Josef Veselý 18 years to build. Then it's on to the former offices and laboratory, staffed by a man in a leather apron that bears a striking resemblance to President Klaus. His equipment includes scales, thermometers, pressure gauges, burners and slide rules. It's a wonder he can concentrate though, because in the next room is a recreated Plzeň pub from the 1920's, complete with a soundtrack of chinking glasses and general pubbub. In the final section of the brewery museum there are some painted scenes with face sized holes to pose behind and information about silly world records involving beer. Like the record for drinking a beer underwater and the record for drinking a beer while doing a headstand. This section also deals with collectors' paraphernalia like jugs, mugs, glasses, labels, and bottletops, which is a no doubt a carefully considered lead up to the gift-shop beside the exit of the museum. The shop has Pilsner and Gambrinus products at quite reasonable prices, but you could also just save your money and spend it next door at the pub U Parkanu, which is the only place outside the brewery that serves unfiltered Pilsner Urquell on tap.